We will be deploying Patch 1.2.0 on Xbox One, PS4, and PC tomorrow, April 4. Check out the most notable changes with 1.2.0 below. Added in-game support for upcoming Lost Tales of Greece. New! 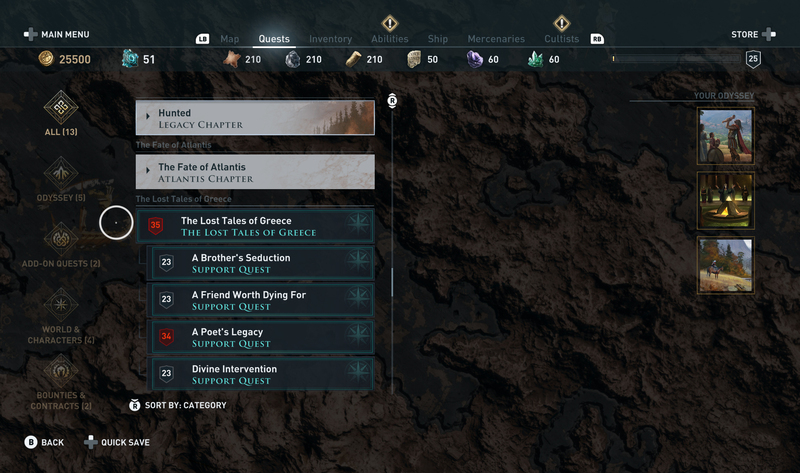 Lost Tales of Greece are now highlighted in the Quests log. New! Added Custom Gear Loadouts feature. The Legendary sword, Prometheus’ Sika, now has a warrior engraving as intended. Addressed an issue that prevented Primary attributes from upgrading. Players will now take damage when the oxygen bar is depleted. Players can now change the resolution modifier by increments of 10%. The newly added Viewpoints with TU1.1.4 will now be automatically completed when the region was discovered already. [PC] Added support for MSI Mystic Light. Addressed a visual issue with the reward for looting the three letters in The Last Magi. Addressed an issue in Smoke and Fury where a Persian NPC wouldn’t participate in combat. Addressed an issue in Daughters of Lalaia where Thyia could sometimes be MIA in the cinematic when interacting with the Magistrate in Phokis. Untracked Lost Tales of Greece quests will now appear blue instead of white. Addressed an issue in New Game+ where players sometimes could become stuck in the Forge. Uncollected Orichalcum nodes are now present in the world in New Game+. Addressed an issue where players could lose their items in New Game+ upon looting the same item with a higher level. 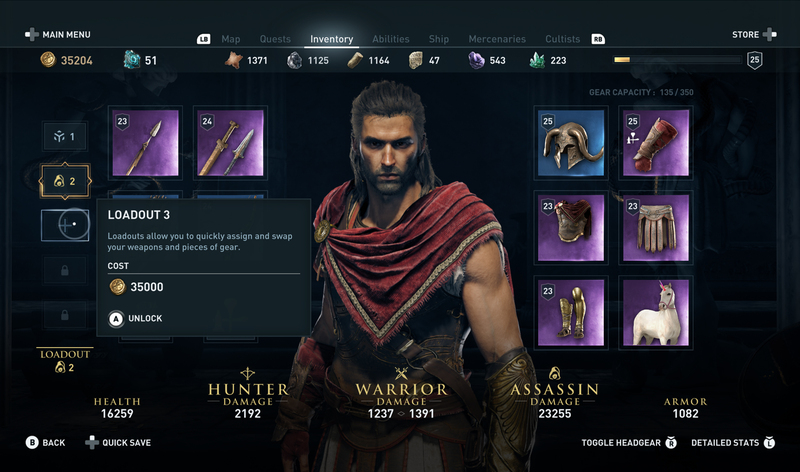 Legendary Upgrade in New Game+ will no longer make the item higher level than the player. Addressed an issue where A Friend Worth Dying For couldn’t be started in New Game+. Addressed an issue that prevented Myrrine from reaching her destination. Addressed various quest progression issues upon killing and confirming the kill of various NPCs. Addressed an issue where snakes wouldn’t be inside the bathhouse in Enough Is Enough. Enough Hiss Enough. Addressed an issue in Moving On where the quest would be completed when the requirements weren’t met. Addressed an issue where players couldn’t upgrade their spear at the forge. Addressed an issue in Paint It Red where the quest markers would sometimes disappear before reaching the destination. Addressed an issue where The City That Cried Wolf couldn’t be completed as the wolves wouldn’t spawn. Where-wolf? Addressed an issue in Bare It All where players couldn’t loot the Amulet. Addressed an issue where players were missing the sub-quest Speak No Evil. Addressed an issue in The Doctor Will See You Now where players couldn’t process with the quest after getting the forceps. Addressed an issue where Nikolaos will have a different hairstyle after the conquest battle in The Last Fight of Aristaeus. Addressed an issue where players were missing all main story quests after a loaded game save. Addressed an issue in Throw the Dice where the quest items could sometimes be missing at the intended locations. Addressed an issue where players couldn’t interact with the Sphinx or complete the quest Lore of the Sphinx. Addressed several issues where NPCs could sometimes die after a cut scene. A bit too dramatic don’t you think? Addressed an issue where the Eagle Bearer in Would the Real Eagle Bearer Please Stand Up can be killed by the player before speaking with him. Say that again but slowly? Addressed an issue in Ashes to Ashes that prevented players from completing the quest. Herodotos will no longer slide right after the dialogue is finished in Regrets. Addressed several behavior issues with Lieutenants once they have been assigned to the Adrestia. Addressed an issue where enemy ships could exceed Level 99. Addressed an issue that caused Athena/Octopus’ bows to be missing. Addressed some graphical issues that occurred in various regions. Addressed various gear texture issues. Improved an animation when activating Rapid Fire while crouched. Addressed an animation issue with the Fury of the Bloodline ability when attacked by another NPC. [PC] Addressed an issue where the game looked washed out with FreeSync 2 enabled on HDR monitors. Increased the invulnerability window at the end of Fury of the Bloodline. Addressed an issue where players couldn’t use combat and melee special abilities under certain circumstances. Elemental resistance now works as intended and provides bonuses to the player based on the total value. Hephaistos’ Workshop Tier S2 20% discount is now applied properly. Addressed an issue that caused the Crit Chance at full health perk to not work as intended with overpower attacks. Addressed various UI/HUD display issues. Addressed various lip sync issues. Addressed an issue with the Transmog System where the hidden item slot wasn’t working as intended under certain circumstances. Addressed an issue with the Sceptre of Samothrace where its visual wouldn’t be available as a Transmog option. Addressed an issue where Aya’s lieutenant would be missing a legendary perk after Title Update 1.1.4. Addressed an issue that could cause a double fade when accessing the Engraving section of a blacksmith. Addressed an issue where fast travel was grayed out. Addressed an issue that caused the Level 99 pop-up to display a wrong message. Addressed an issue where the Olouros Fortress location is not marked as completed. Addressed an issue where Tomb locations wouldn’t be marked as completed upon activating the Stele. The Pond of Tainaros is now marked as a Historical Point of Interest. Addressed an issue where unused ability points could be missing after Title Update 1.1.4. Addressed an issue that could occur when scrolling rapidly between Mercenary tiers. [PS4] Addressed an issue where PlayStation®Vita system controls overlap with the ability menu. [PC] Addressed an issue where the Skip button during cut scenes has Controller feedback while using M&K. [PC] Addressed an issue with the Benchmark tool where the Adaptive Quality option didn’t function. [PC] Addressed an issue with the HDR option that would be displayed as off while activating after changing graphics settings.